Can the Dawgs put together a complete game? You know, play solid special teams, run and pass well, play the defense we've seen? Malzahn could find weaknesses in the Magnot line, given enough time. Their defense looks like Ted Roof is the coordinator. Chizik will pull out all the stops, so we'll see at least one fake punt/onsides kick/fumble ruskie. 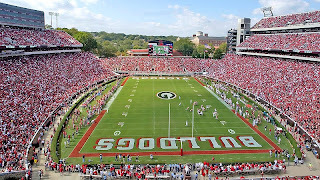 With what is on the line, can the Dawgs play their best game? Does Bobo keep the play book open? Last week (I know it was NMSU), we ran every play we had. Hell, we ran plays I didn't know we had. They are ok at stopping the run, when they key on it (see the South Carolina game). That doesn't mean we shouldn't run, but it should mean that if we aren't having success with one facet, move to another. Fun stat: Auburn is allowing the second most plays per game (72 per game) in the conference. If the no huddle will work, now is the time to exploit that. Can we avoid the headscratcher game on defense? I bet Malzahn had wet dreams about the wheel route, at least before New Mexico State ran it successfully against us. That only gave Grantham something to yell at people about. Of course, it also doesn't mean we won't go back to the old system of 'what me worry?' when a dude sneaks off by himself on the wing. Match up wise, this looks to be a good game for getting some sacks, but you have to always be worried about the ability of Dyer to make good things happen. If we play strong run defense, I'm ok with no sacks. I'm not ok if Dyer gets 200 yards. Overall, the paper match up favors Georgia. However, this is Auburn, so you know what you can use that paper for. Just win baby, I don't care how ugly. Just win. Sorry TD - after the way Auburn totally made asses of themselves last year, I want to BURY them. I'll never forget Tropper Taylor and Nick Fairly "hi-fiving" after the hit he put on Murray. Don't get me wrong, I would like to see every Auburn fan, including their band, to be gone by the beginning of the 4th quarter. As long as we hold our composure and don't let them Vandy us, I feel good about it. If we let them get under our skin, it won't be nearly as pretty.